Welcome to our new podcast discussing the podcast-to-TV series, Homecoming! 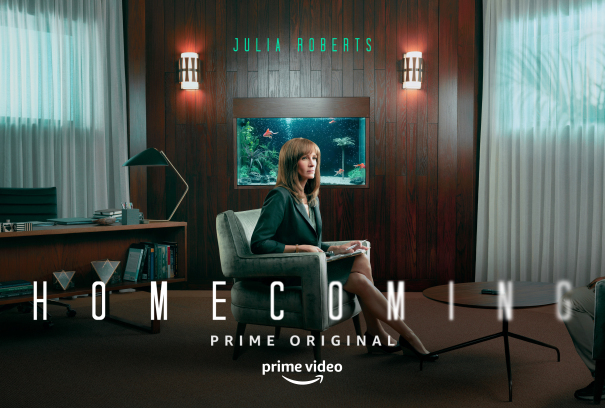 Homecoming drops 10 episodes, 30 mins each, on Amazon Prime Video on Friday November 2nd. Homecoming is the story of Heidi Bergman, a social worker tasked with trying to help war veterans re-adjust to civilian life. In this series, we’ll see two timelines. The present day timeline follows Heidi in her job with the Homecoming Initiative, the other is set in 2022 where she is a waitress at a diner and seems to have little memory of her past. In our introductory episode, we answer some questions you may have. You definitely DON’T need to listen to the podcast before watching this series. It’s the same story, but with more characters and depth. Fadra loved the podcast. Shannon listened to two episodes and like the story, but had a hard time with all the “noise.” They purposely recorded the podcast to sound like a mashup of bits and pieces of phone calls,recorded conversations, and therapy sessions. There’s a good amount of background noise that Shannon found distracting in a podcast. But she’s excited to follow the story with a visual element. Podcast creators Eli Horowitz and Micah Bloomberg are attempting to keep the “claustrophobic” feel of the podcast. Sam Esmail, the creator of the dystopian thriller “Mr. Robot,” is directing. Julia Roberts plays Heidi, and this is her first TV show EVER. Stephan James plays Walter Cruz, Heidi’s patient. Bobby Cannavale plays her boss, Colin. Sissy Spacek plays Heidi’s mother. Amazon has already committed to two seasons of Homecoming.